Designed by Todd Rexford, the Boker Plus Epicenter is an exciting new knife from Boker that represents a step out of the norm for them. This hefty framelock knife features 5mm thick titanium scales that are contoured for maximum comfort. 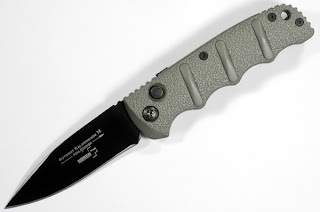 The VG-10 blade has a satin finish and a plain edge. When you pick this knife up, you instantly notice the attention to detail that went into the design and construction of the knife. The dual thumb stud is removable and the knife comes with a small wrench to do just that if you want. The barrel spacers have a unique design that I think gives the knife extra character. The titanium pocket clip can be tip up or tip down. If you are looking for a high quality folder knife with heft and character, check out the Epicenter by Boker and Todd Rexford–I think you will really like it.